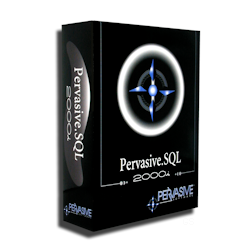 The Pervasive.SQL 2000i Software Developers Kit (SDK) is designed for developers of database applications that want to access the Pervasive database. It provides all of the information and modules needed to write applications to the Pervasive.SQL 2000i environment, including a copy of the three-user Workgroup Engine. This is a discontinued product with only ONE copy remaining. Please contact us to place an order.